My mum’s sultana scones, leftover bacon & kidney pie, made-by-me sticky orange and cinnamon scrolls. b) acceptable to the other kids (“kidneys? Errugh!”). Now, with my eldest daughter about to head into senior infants this September, I’ve one year of making school lunches under my belt. Most days it was a triumph of hope over experience as I made wraps from leftover roasts, or cheese sandwiches (challenging, when she keeps switching allegiances between supermarket cheddar and Gubbeen – only available at markets 30km away) and shoehorned a pot of granola, a tangerine or handful of carrot sticks into her lunch bag. At least the food that made the round trip tasted good as I repurposed it for my own lunch. But I’m starting the new school year with a clean slate. Plus, the six-year-old’s palate is so much more developed than her junior infant one so it’s all going to be So Much Better. Honestly. 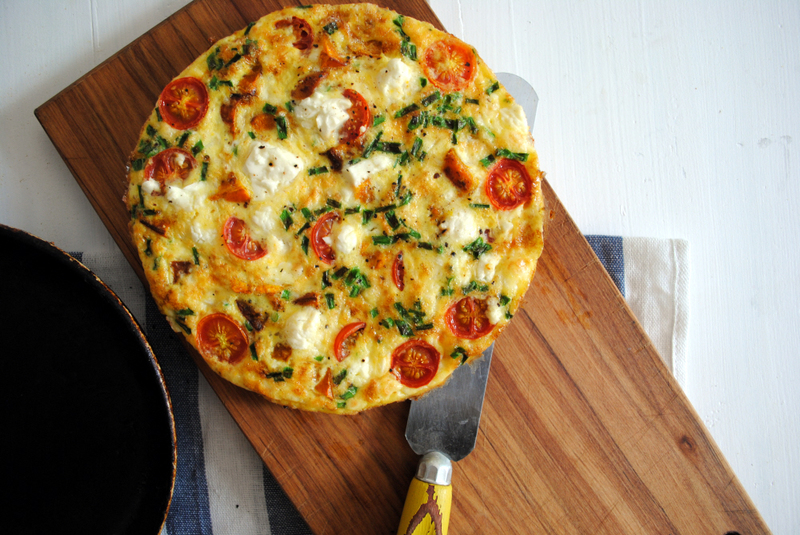 A tortilla is a great way of getting vegetables, protein and dairy into one slice, as long as they eat it! This is a simple template of a recipe. Larger pan? Just adjust the ingredients upwards. You can use any cooked vegetables – try potato, squash or sweet potato – with whatever cheese you have in the fridge. Crumbled goat’s cheese, grated cheddar and cubes of blue cheese are all good. Adjust for your own little darlings’ taste. Serves 2. Heat the olive oil in a 20cm frying pan – I use a cast iron one – over a medium heat. Whisk the eggs lightly together, then stir in the cooked pumpkin, feta and chives. Season to taste, keeping in mind that the feta is already salty. Pour the egg mixture into the hot pan, top with cherry tomatoes, turn the heat down low and cook slowly for 10-12 minutes or until set. To speed this up, you can always pop the tortilla under a preheated grill for a couple of minutes. Let it settle for five minutes then cut into wedges to pop into a lunchbox. Serve at room temperature. First published on the Irish Country Living blog. Over on the Irish Food Writers Guild website, Lizzie Gore Grimes and I have put together some resources to help you in making a healthy lunch box. Check out the full article here: What’s in your lunchbox? Many schools now have a nut-free policy, which cuts out any chance of peanut butter sarnies. Susan Jane White makes the case for seed butters – just like nut butters, only cheaper and healthier. Tahini and honey sandwiches are favourites in her house and she also said that pumpkin seed and hemp seed butters are fabulous. The only thing is getting the smallies to actually eat it! Sometimes simple omelettes, rolled up in a wrap, work nicely too. 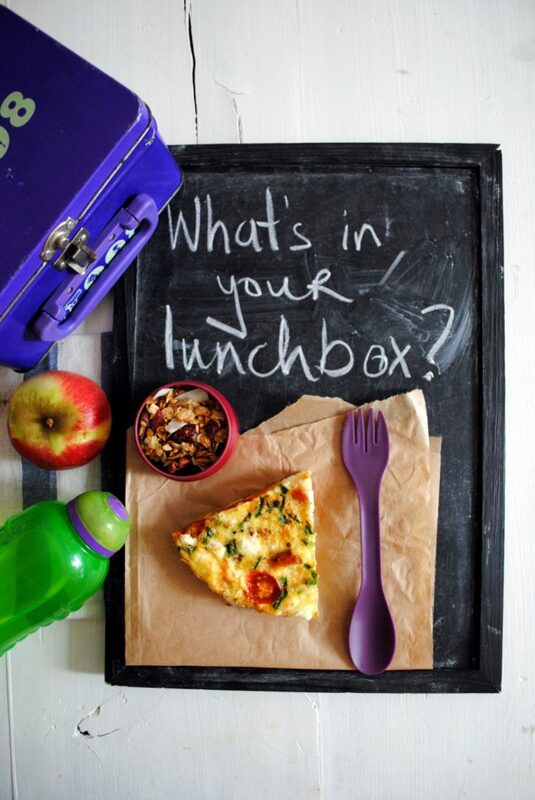 Bibliocook - All About Food > Cook > Lovely Lunches > What’s in your lunchbox? Pumpkin and feta tortilla!